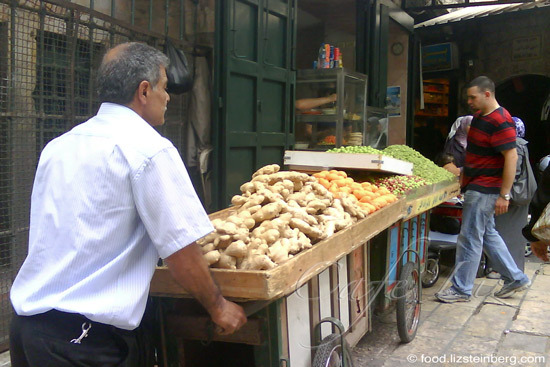 The streets surrounding the Damascus gate are one of my favorite places for food shopping in Jerusalem. The markets teem with people, and competition is fierce. 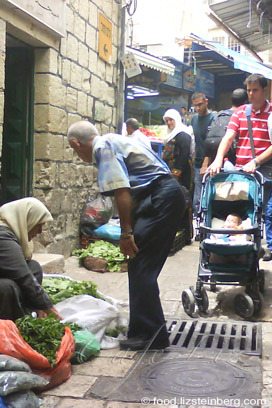 Unlike the markets in Tel Aviv, you won’t find any exotic imports or the latest agricultural trends — no French bread or purple potatoes here — but you will find lots of classic Arab staples, done well. After all, when you have half a dozen coffee roasters in such close proximity to one another, and such high turnover, is it any wonder that Izhiman will sell you beans still warm from being roasted? When you notice, he’ll smile in pride. Many of the roasters, including Izhiman, sell the same bean roasted both lightly and darkly. Going price is about 5 shekels per 100 grams. If you want, you can get your beans ground or premixed with cardamom. Izhiman also has dozens of kinds of essential oils in little 30-milliliter jars, all selling for 10 shekels. I don’t want to think about how much they’d cost in Tel Aviv. But back to the Muslim quarter. 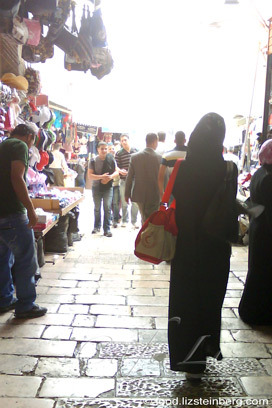 (In the photo: The Damascus Gate from inside the Old City.) This is the place to find out what uber-local vegetables are in season. You can shop at the vegetable stores along the bus depo, right next to the light rail tracks, where they have an excellent selection. Or you can buy from the little old ladies sitting in the street and selling greens out of plastic bags — though you’ll have to conduct your business in Arabic, or use sign language. In the winter you’ll find all forms of leafy greens, things like wild spinach and Jerusalem sage (no resemblance to common sage). Theoretically you should also find wild beet and chicory, though no one was selling these greens when I was there in mid-February. What’s all this talk about stuffing? The lazy may be lucky enough to find their vegetables being sold pre-hollowed, tidily packaged in little bags — all you have to do is add filling. (In February, these vegetables included carrots and potatoes.) Don’t worry, we won’t tell the neighbors you didn’t do it yourself. This is also the place to find wooden molds for ma’amoul cookies (usually 10 shekels each), and grill pans for making flatbreads at home (50-60 shekels, depending on the size, not including the power cord). Why those same grill pans cost three times the price at the larger Mahane Yehuda market, I don’t know. Just don’t trip over the flocks of tourists outside the Austrian Hospice. (A beautiful place inside, but — how can I say this? — I’m just not that into their coffee or cakes. In the photo at right: The view from the roof.) Or those photographing the stations of the cross. Also on offer — vegetable corers (choose the ones whose blades don’t twist), enameled coffee pots (finjan in Hebrew) for making coffee on the stovetop, juicers of varying quality and lots and lots of little teacups with golden accents. 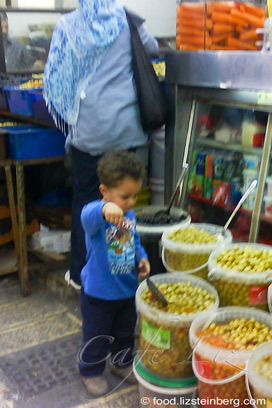 And, of course, lots of little stores selling sweets like baklava and basbusa, as well as the spice shops drawing passersby with massive, carefully shaped pyramids of powdered zaatar. (How does this work? We asked. Apparently they leave the spice pyramids on display for about three days, then package that zaatar up to sell and build a new pyramid.) Those dried yellow petals marked as saffron? That’s actually safflower, and it should be priced accordingly. Those white, chalky-looking balls? Dried cheese. While you’re at it, keep your eyes open for jibneh — the name just means cheese in Arabic — an unaged, firm, white sheep cheese generally sold in rectangular blocks, inside bags with some liquid. At 25 shekels a kilo, even the government price-regulated cheeses can’t compete. 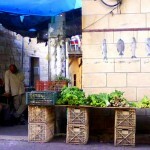 The little store right inside Herod’s gate should have some. All this walking made you hungry? 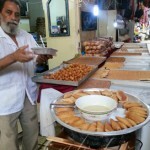 When the weather is nice, you’ll find lots of street vendors out selling falafel, including oversized balls stuffed with onion and sumac. 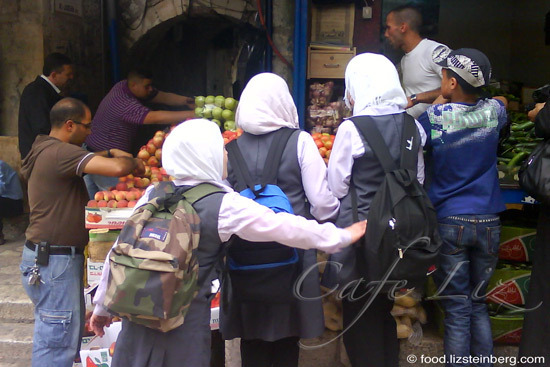 (In the photo: Schoolgirls buying fruit.) When it’s cold — remember, we hibernate when there’s any sign of rain/the temperature drops below 20 degrees Celsius — you can still find a handful of restaurants selling grilled meats, falafel or hummus along the main shopping thoroughfares. Because nothing says love better than heart-shaped falafel. 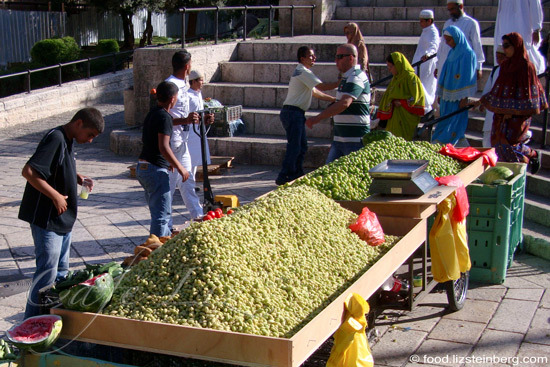 8 Responses to "Treasure hunting in Jerusalem’s Muslim quarter"
Oh I would love to go there again ! 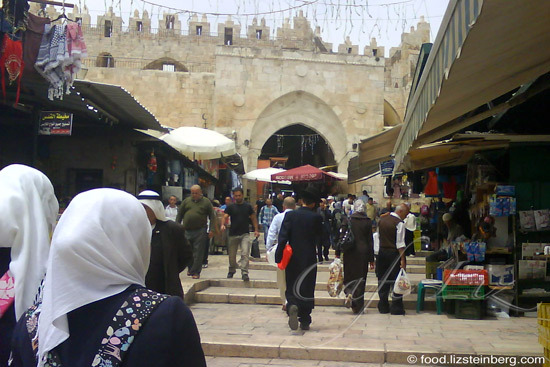 2 years since my last visit to the Arab quarter…..
What a fun virtual trip. 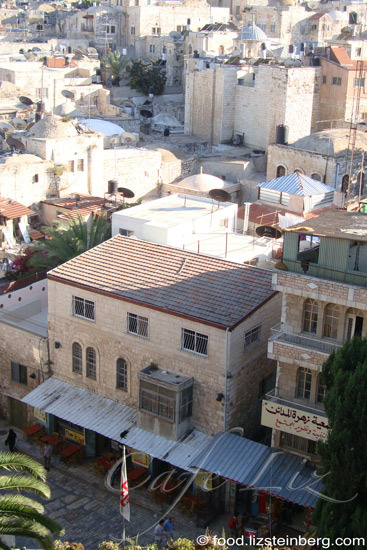 I haven’t been to that part of Jerusalem in a long time and must pay a visit. 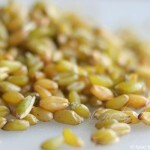 I love this, thanks for taking the time to give us a peek into the local markets. As much as things have changed, like the rail, it sure looks like the same and wonderful old city. 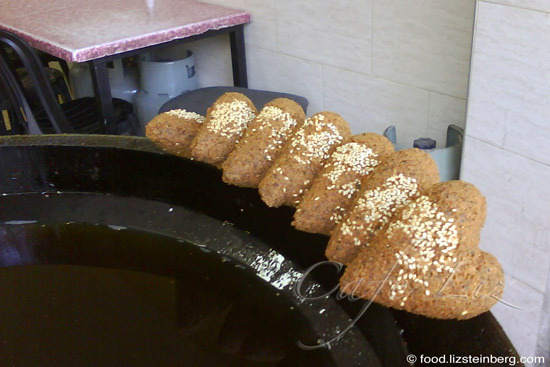 How I miss those amazing sesame “bagels” with the small packs of zatar. So, so jealous. You are eating every day in one of my favorite food areas of the world. I’ve only gotten to spend 2 weeks there so far, can’t wait to go back. Ben Freedman, who is a regular visitor/commented on my blog pointed me to your site, and I’m glad he did! Hi Michael, believe me, I appreciate being (and eating) here! Definitely worth spending more time here if only for the food. Thanks for dropping by.